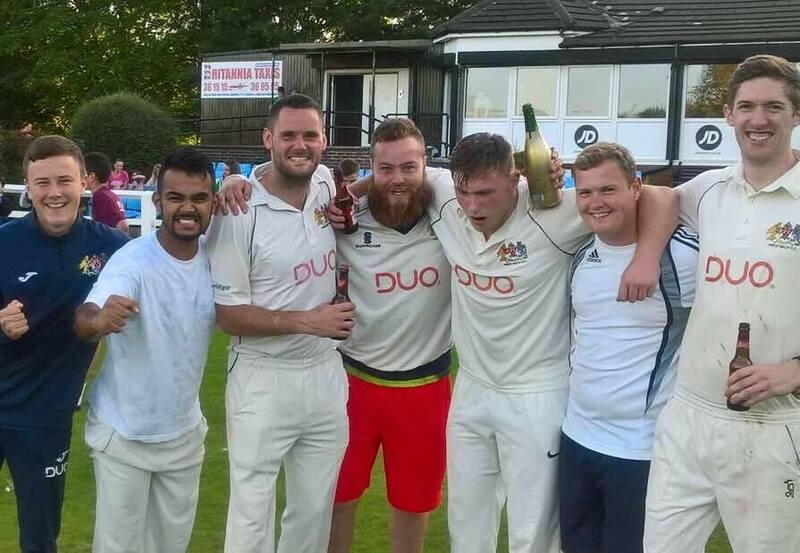 Prestwich enjoyed a bitter-sweet but thrilling end to their first season in the new Greater Manchester Cricket League. The first team lost a title decider to Egerton on the final day to finish runners-up in the premier division. But a week later, the second team went one better by winning the division three title, after taking 42 points from a possible 44 in the run-in. The Egerton showdown was worthy of its winner-takes-all billing between the two top sides in the division, but not before huge clean-up operation had been mobilised to get The Heys ground fit, after yet another deluge of untimely overnight rain. Prestwich exasperatingly fell 35 runs short of the target set by Egerton, who were indebted to a sixth-wicket parternship of 84 by Anthony Clegg (30) and Daniel Partington (42), after the home side had dismissed the top five for 70. Sam Holden finished with 4 for 45 and Mike Finan 3 for 38 as the visitors were all out for 175. Prestwich’s reply went from solid to sticky as 30 for 0 became 31 for 3, and threatened to have found quicksand at 56 for 5. But Ali Raza and Tom Scott staged a 40-run rally before Raza (36) became the second casualty of three controversial l.b.w. decisions. Despite a late blast from skipper Andy Bradley (25), former Prestwich professional Amal Dalugoda grabbed four wickets to wrestle the championship trophy away from Prestwich’s grasp. There was a happier outcome for Prestwich 2nds who travelled to Heywood for their last game, knowing that a maximum point victory would guarantee them the division three title. Four wickets each for Stephen Ritchie and Oliver Holt, aided by two wickets from Nathan Bailey, restricted Heywood to a modest total of 115, although they had been 109 for 4 until a late collapse. Nick Carter was wicket-less on the day, but his excellent season with the ball meant he could still have won the bowling averages for the whole division. But it was edge-of-the seat viewing as the target had to be reached without Prestwich losing more than three wickets to win the title outright. Led by a superb 70 not out from Lewis Smith, Prestwich only lost two wickets to allow skipper Peter Lorenzini to get the champagne corks popping.